The Cyprus government has accepted an offer by the UK to assist in efforts to resolve the title deed and numerous property issues faced by home buyers of all nationalities in Cyprus. THE British High Commission yesterday welcomed a government initiative to coordinate efforts to resolve title deeds problem facing British home buyers here. “We welcome the Cypriot Government’s plans to work towards a solution to the property issues that so many UK and Cypriot nationals face,” a spokesperson told The Cyprus Daily yesterday. “And we are grateful for the steps the government has taken so far. The UK continues to support and offer assistance to the government in their efforts to tackle property issues,” it added. Cabinet’s decision came at the proposal of the Foreign Minister to tackle property buyers’ complaints against the Republic of Cyprus. 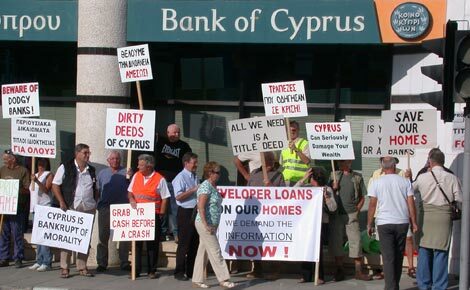 Many British home buyers have complained about failure by Cypriot developers to issue title deeds. The Cabinet proposal includes cooperation between a ministerial committee to be set up for this purpose- and representatives of ministries and government services with the High Commission. “The UK, will of course, continue to offer assistance to the Cypriot government to help tackle the many property issues faced by homeowners of all nationalities in Cyprus. “The High Commission will continue to raise concerns with the Cypriot government including at Ministerial level and we continue to work together to find a solution,” it added. The Commission encourages anyone experiencing problems with property to seek legal advice by engaging an independent lawyer who will be best placed to advise on rights and methods of redress. The Interior Ministry is responsible for coordinating the cooperation with the High Commission but Reform Commissioner Emmanuella Lambrianides will be responsible for amending the law and monitoring property market issues. Sorry andyp but do you think laws are implemented here? This is Cyprus after all, where else can you park on the pavement and get away with it? Nothing will happen to resolve the title deed fiasco and you guys really have to get used to it. The UK offering help to the Cypriots re Title deed delays? get real you can never understand the mentality of these Cypriots don’t even try. Possession is nine tenths of the law, so with or without title. Sorry aggis but welcome to our “club”. Nothing but deaf ears have been available to us for years. No doubt you would not be suffering due to the changes people made to properties if final completion certificates were available at point of sale too. But then again are developers not breaking the law by allowing occupation of such properties anyway? Hollow, patronising, overly-optimistic weaselwords that won’t really help or even assure the many thousands of Cyprus property buyers who have been well and truly ‘caught’ by the collectively fraudulent practices and procedures of many developers, banks, lawyers, typically it seems working in ‘cahoots’, and tolerated if not even encouraged by successive weak Cyprus governments. And the suggestions that those affected simply go find a good independent lawyer smacks, really, of ‘more of the same’; those, many, affected must surely cringe at the thought of finding, paying yet more lawyers. How about the HC working urgently with the RoC government to publicly ‘accredit’ Cypriot lawyers who have a) a good ‘clean’ track-record b) the knowledge, skills and commitment to identify and progress appropriate, effective legal actions and c) the commitment to work their way through (rather than ‘around’) the myriad of scams that have clearly been tolerated, if not actively encouraged!, in the past. There may not be many who meet these criteria, but it would – surely? – be a Start, a sign of commitment, rather than simply pushing out more ‘welcoming words’. I really don’t know where to start: I’m an honest developer with no loans sold over 100 properties to good clients, some have mortgages/loans, when they bought the banks wanted “bank Guarantees for titles” I suggested at point of sale to give them a piece/share of my existing land, the loaning bank would not lend on that basis, they wanted guarantees so that every year they get the fees for this, which I’m sure the banks make millions of euros just from the fact that there are no titles. The problems I have now is 80% of the properties I sold the buyers have made illegal changes i.e. built store/sheds, covered verandahs, built boiler rooms, even car ports and some extensions to their houses thus resulting in not getting clean final approvals. On the 30th July 2013 I had a meeting with the Minister Of Interior and since then had various conversations even screaming matches on the phone with him, I simply got nowhere, I have now given up, I really don’t care, This Island is run by a bunch of sickos and thieves, and I cant see anything changing not even troika/UK getting involved. I still think the banks have a huge control over the government and its departments. Steve.R has summed it up admirably in his last sentence. I wouldn’t tar all Cypriots with the same brush, that is just unfair and patently not warranted, but those involved in the property sector by and large are culpable and deserving of ridicule and mistrust. As much as I’d like to think otherwise I reckon the Cypriot government will use the ‘interference’ of the UK as an excuse to further delay and prevaricate. If they had the slightest intention of complying with Troika they would’ve made it known before accepting the hand of the Brits. If the Cypriots had one ounce of expertise we would not be in this terrible mess in the first place. The EU and UK would set out guidelines and Cyprus would pick out that bits that suit them. “Welcoming the Cypriot Government’s plans” is probably the most hollow expression used to surround this issue and has to be the most frequently quoted phrase in articles such as these year upon year. so come on all you Trustworthy Lawyers and I am certain ,that there are quite a Lot of You ,out there, Just do the right Thing, let us ALL have our UNENCUMBERED Title Deeds, For which we have Paid, in good faith. There is no feeling greater, than when someone comes up to you and shakes your hand for being Honest, and helping people who need a good and Honest Lawyer who will stand up for what is RIGHT. Thank you AndyP . Alan Morton ,Pippa and Costas Apacket for your words of wisdom. @ Nigel, this is indeed an encouraging development. Would you please confirm that this is the ‘constructive work’ that Mr David Lidington, UK Minister for Europe, referred to recently. Could you please publish, if you have the information, the email and postal addresses of the Reform Commissioner, Emanuella Lambrianides. I would be most grateful for your reply. KD. Nigel with respect, perhaps even the amended Specific Performance Law is not an effective solution to the problem. Loans secured on sizeable developments may be tens or even hundreds of millions of Euros. The lenders security covers the whole development, and even if the terms of the loan have been adhered to, it is not clear how an individual plot with no separate title deeds could be effectively released. The situation is further complicated where buyers mortgages have been guaranteed by Developers. Further the new law appears to be of no relevance to the many buyers who are already caught in this trap. The original problem might have been avoided if all developments had been divided into individual plots at the outset. The deeds to the land should have been issued to purchasers on payment of the sum agreed for the plot. For this to happen the Developer would have had to negotiate with the lender for the release of the specific plot as part of the conveyance process. This should have been a condition of the sale contract and the buyers lawyer should not release funds from escrow without checking that the security had been released. A buyer could then proceed with the build, covered by a separate contract with either the developer or another builder, with some confidence. This would have avoided a large amount of Property Transfer Tax on new builds and rendered the properties fit for resale and mortgage. If the property market is ever to recover in Cyprus, the conveyancing process will have to be regularised and the Specific Performance Law replaced. It seems that the authorities imagine that the existing mess can be cleared up by just waiting for it to be ‘inflated away’. I expect that many buyers in small developments were informed that their developer had a loan (mortgage) to commence the build of their property, but expected that this would be repaid to the bank when the buyers stage payments filtered through, so that at the end of the build with the final payment the loan would have been be repaid and the developer would have a useful profit to put to his next project. Then our title deeds would be issued. This is the way in a civilised country the system works. Unfortunately many of us from Northern Europe did not expect to be scammed and ripped of by unscrupulous banks and developers and a system that is no better than fraud. Yes we did our homework, we did as much due diligence as was possible, but we were still let down. All we want is to have title for property we have paid in full for in good faith. As for the situation regarding mortgages. The replacement Specific Performance Law that was introduced in 2011 enables a buyers to repay an element of any existing mortgages to the mortgage lender and the balance of the sale price to the vendor. So if a property being purchased for (say) â‚¬200,000 has a mortgage of (say) â‚¬50,000, the buyer can pay â‚¬50,000 to the mortgage lender and â‚¬150,000 to the vendor (just like the way the system in the UK operates). However, you are still reliant on your lawyer to advise you of any mortgages – and also of any planning issues! And as for unpaid taxes and other claims against the property, you’ll still be in a mess (even though there may be no problems when your lawyer checks). Mathew, we don’t want another committee led carpet sweeping or can kicking down the road exercise. What we want is our unencumbered Title Deeds issuing now, and we also want the Ottoman based property laws in Cyprus replaced with a modern EU system that results in Title Deeds being transferred into the name of the individual property purchaser at the point of sale / transfer of their property, plus transparent and open public access to the Land Registry systems. Although to be fair back in the day there was very little info to tell buyers otherwise and the professionalism and integrity of ones lawyer was simply assumed, wrongly as we now know. We did ask her at the time and she said she wasn’t and neither did she do any work for the developer! My point is we simply do not know who to trust and in reality what can they do? How does a new lawyer go about removing a developer’s mortgage from your property when a bank has been given security over it? As for the planning issues if that is preventing the issue of deeds yes you could take the developer to court to recover your costs in rectifying these problems but many of these planning issues can never be rectified by one owner alone. What can a new lawyer do here? Unpaid government taxes by your developer. What can a new lawyer do for you here if that is the problem? here? @andyp – unfortunately most people did not take independent legal advice when they purchased property. In many cases the lawyers they used were in bed with the developers (and in some cases literally). The Cypriot government should pass a law forcing the issue of title deeds to everyone who has paid, in full, for their property. They should, also, legislate to enforce the banks to pursue those developers/companies/individuals who are failing to repay their loans and to sequester their properties/possessions, not those of the innocent home buyers. Where fraud can be shown, especially failure to pay taxes etc, then action should be taken and they’d probably find that by jailing one or two the rest would pay up. Come on Matthew the above is what put us buyers in the s**t in the first place and most of us do not have the money to keep paying lawyers. Whilst I applaud any effort to help this does not really tell us nor promise us anything. We all know the problems that must be tackled, developers debt on our properties and planning problems, yet they are never publicly mentioned by politicians.